Here’s one way to use Molive, the citizen journalism site where folks post pictures of the strange and wonderful things around them in China: bringing everyday street-level publicity efforts, the kind you see all the time in Chinese cities, to a wider stage. 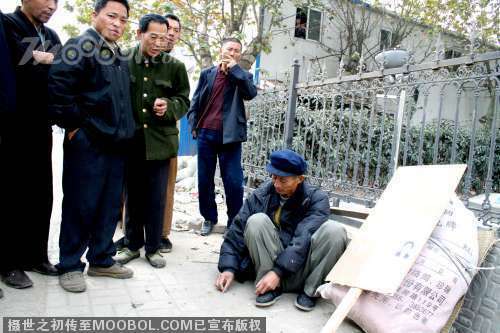 An apprentice journalist in Nanjing decided to help an old man passed by on the way to work, who is looking for his son. The father was apparently camped out near the news agency–many poor people make direct appeals to the public via print and news media for help. Link. 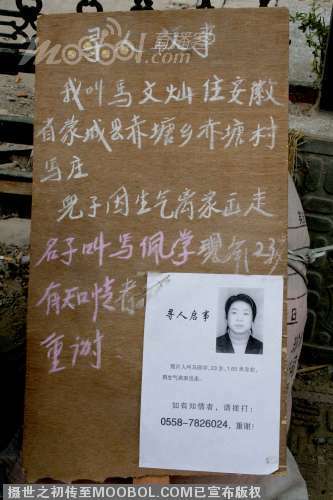 Mr. Ma is from a village outside of Nanjing and has been carrying his sign around with a photo of his son, sleeping on the streets and getting food and money for survival from passersby. Although this appeal seems genuine, a lot of those appeals where people write their sad stories on the ground with chalk seem fake. I hope Molive won’t allow pranksters to gain an even wider platform for their trickery. I was both amused and thrown off that there was a contact number!